Scratching things off one’s bucket list often goes in spurts. One long lead item finally has a line through it… thanks to the Great American Solar Eclipse of 2017. Sometime back in March a workmate asked what I might do for the eclipse. I knew something was approaching, but his reminder surprised me. 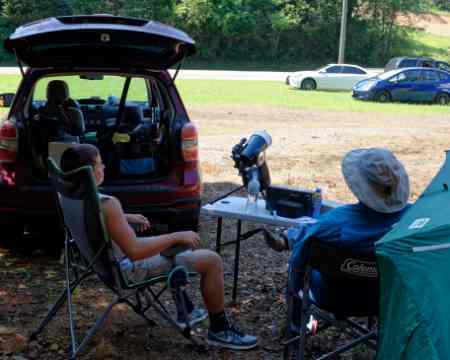 His approach to this event was “I’m going to watch it.” There are lots of ways to enjoy an eclipse without actually seeing it, but, yes, simply witnessing it has broad appeal. 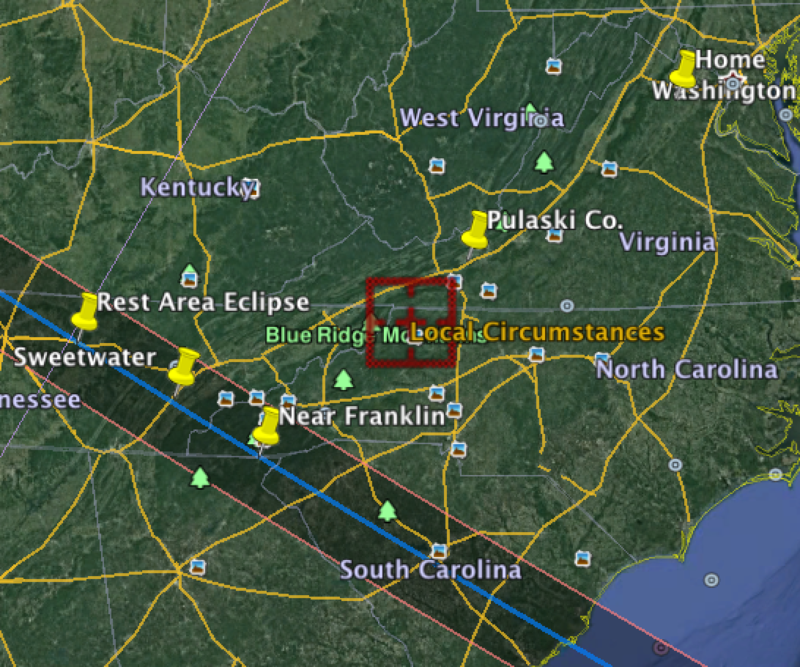 The path of the eclipse brought with it many possible locations from Tennessee to South Carolina. An eclipse this close to home was just too good to miss. I agreed with his approach and made plans. 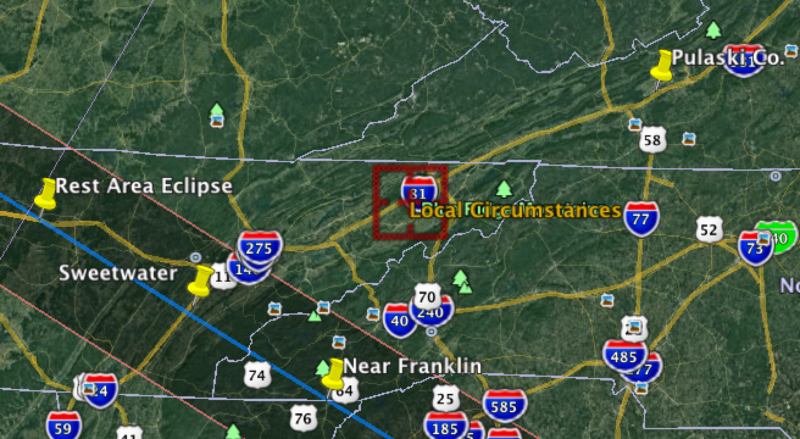 With the eclipse line passing so close to Virginia, planning was simply figuring where to drive so no overnight accommodations requiring reservations were necessary. This flexibility proved to be empowering as the days drew nigh. Thanks to a reminder from a member of my local astronomy club, take a moment to simply enjoy the totality. Points along I-75 in Tennessee. Determining the final location became a daily check of weather. South Carolina weather looking worse, we traveled to southwest Virginia to pay a visit to an ailing relative on Saturday. 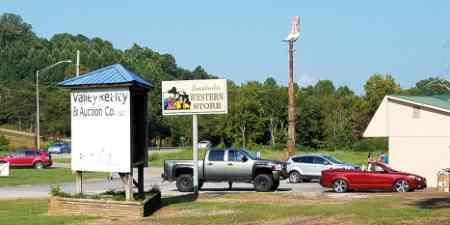 From this point all NC and TN points were readily accessible with a four to five hour drive. A final check of weather at 5 am Monday morning revealed eastern TN as the point of best weather. I programmed a likely candidate along I-75 into the GPS and off we went. Other than getting through Knoxville during a Monday morning commute, the drive was pleasant and uneventful. As we headed south on I-75, flashing highway signs came into view with the admonishment to not park on the highway during the eclipse. 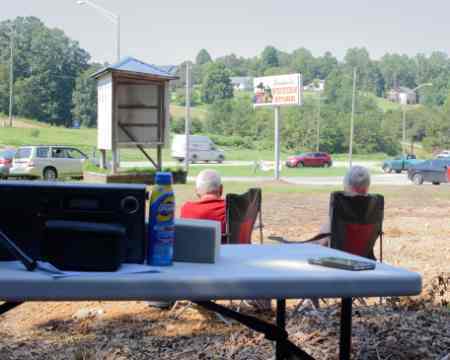 Being rundown by a vision-compromised semi during totality is not on my bucket list so the signs were preaching to the choir. Welcome to the Sweetwater Western Store. 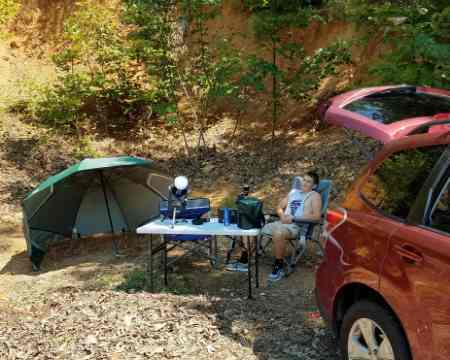 With hours to go before totality, there was plenty of parking. Plenty of time to people watch. Location set, it was time to consider eclipse activities. Reception of one AM clear channel station in support of Sky and Telescope’s radio experiment. The right solution would be to use a software defined receiver and record the entire AM band. We weren’t this well prepared so we tuned in station KMOX 1120 in St. Louis with a simple shortwave receiver. Solar viewing via a little portable Meade SCT with a primary solar film filter from my Venus transit viewing. Solar radiance measurement via my trusty Gossen Luna Pro photographic exposure meter. Two cameras; one Nikon FX format with 28mm fixed focus lends plus a flash to record a “family photo” of me and my son and another Nikon DX format with prime 300mm (effective 450mm) for closeup eclipse shots. 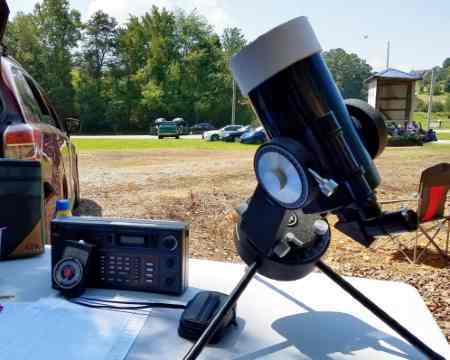 Solar telescope, AM radio and light meter. 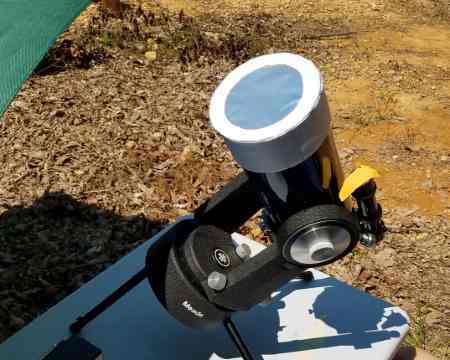 Small Meade telescope with solar filter. This telescope works well for casual viewing, but some folks including my son tried their hand at cell phone to eye piece imagery. Here is his attempt taken at 2:13:27 EDT. Cell phone shot through the solar telescope. Nothing to write home about, but hey it sort of worked even if the very well filtered light was still too bright for the cell phone camera to properly handle. There was intense interest examining the effect of the penumbra on the ionosphere. Many projects are now analyzing radio data taken during the eclipse. Other projects looked for changes in propagation correlating with the eclipse in the shortwave bands. Amateur radio operators planned shortwave soundings. Some scientists suggested listening to clear channel AM radio stations. I originally planned supporting the Eclipse Mob experiment that examined the 60 kHz WWVB signal intensity at many locations. However, all radio experiments were to be secondary to simply witnessing the event. Thus a simple AM radio was the only tool used. Waited his whole life to see an eclipse. The above Ohio couple were on hand purely for the view. The gentleman was barely able to walk, but his wife kindly drove the distance from Ohio to put their first eclipse into the books. 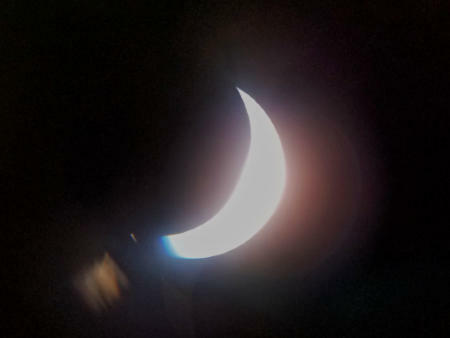 As eclipse time approached I waved over many folks to have a view of the moon and sun through the solar telescope. “To observe and to help others observe” right? Thus began a wonderful many minutes of meeting new people with lots of discussion on broad topics. I used a Gossen photographic meter to record EV intensity vs. time as the eclipse progressed. 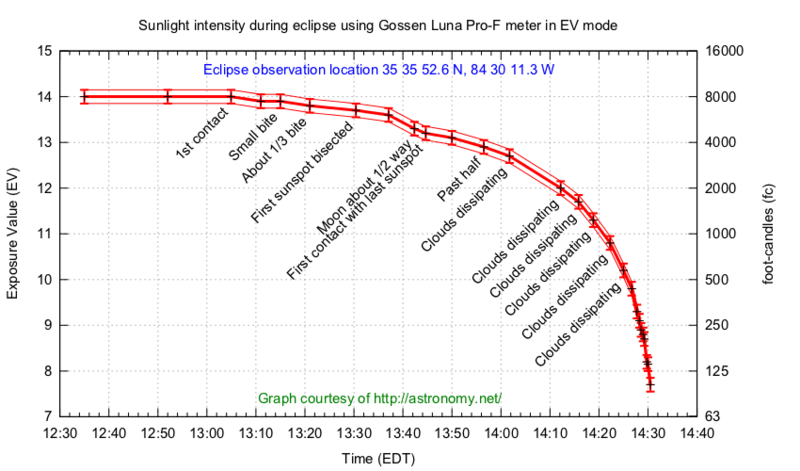 The following graph shows the result up to the time of totality. Click to enlarge or view this PDF. The red traces have a notional error bar to suggest how well and accurately I read the meter. About halfway into the eclipse the solar radiation was noticeably lower. No longer did the sun’s rays feel burning. Things were darker, but the hue of the light was still daylight color creating a sensation of waning light that doesn’t change color as during sunsets. Of most interest, however, were the dissipating clouds. I’ve read many places about the phenomena of cloud dissipation as the progressing solar eclipse reduces solar radiation. 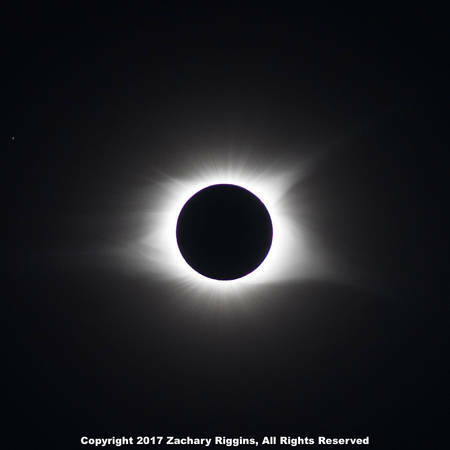 The graph above notes the cloud conditions as totality approached. Zach Riggins’ photos attest to this reality in these two identical shots differing only in time and exposure. 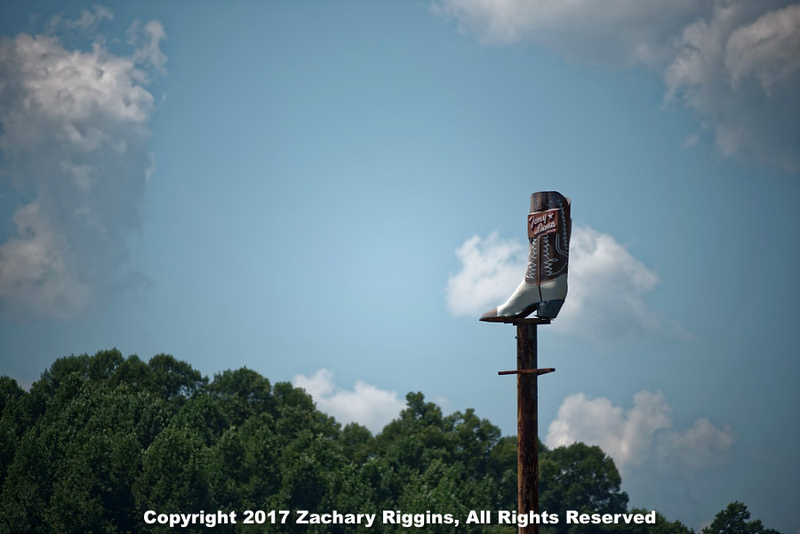 The Sweetwater Western Store is easy to spot from the road. Clouds are still a threat. View of the store “boot” revealing the clouds have almost entirely vanished. It’s well worth remembering this handy phenomena for future eclipses. Totality approached and so began the most interesting several minutes of my astronomy life. I recall eclipse veterans’ tales of shimmering light effects on the ground just before and after totality. Sure enough as darkness quickly approached, I looked down to see what looked like water ripples everywhere. 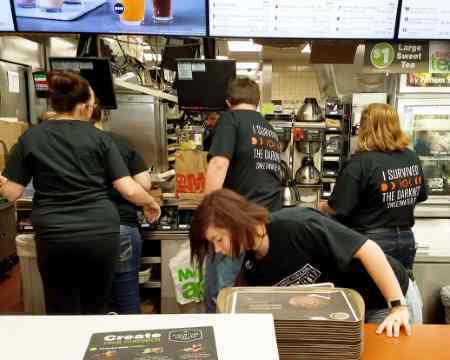 I said “look down” and several people moved their gaze to the ground in amazement. I was dumbfounded. So beautiful. Eclipse shot with Nikon D610, Nikkor 28mm f/2.8 AI lens, Nikon SB-700 flash with amber filter in TTL flash mode, f/16, 1/8 second. Time: 2:35:07 PM near Sweetwater, TN. 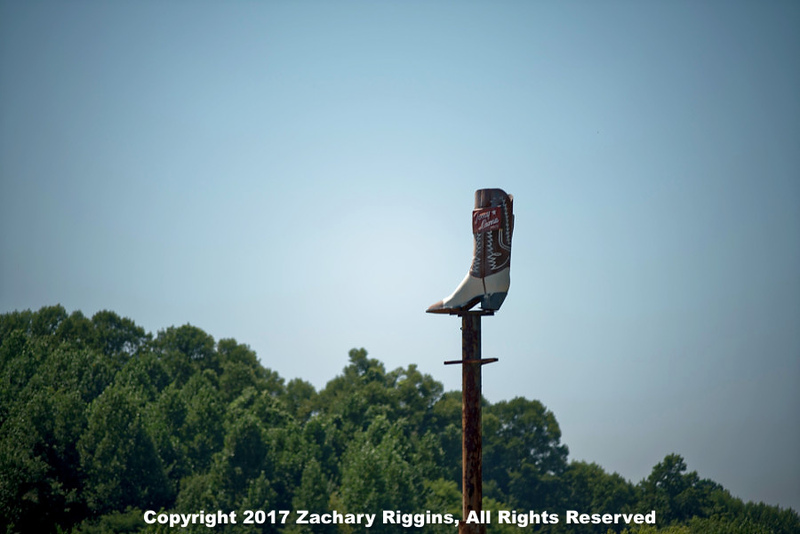 Zach Riggins took this amazing shot processed two ways to reveal details. The moment of totality from Sweetwater, TN. Normalized exposure of totality from Sweetwater, TN. One thing took my quite by surprise and I kick myself for not thinking this through. During totality, all the stars and planets normally unseen in daytime were suddenly there to admire and view. Venus and Jupiter came alive and gave a 3D feel to the sky scene unfolding above us. Then it was over with light pouring down and increasing quickly. Celebration ensued. 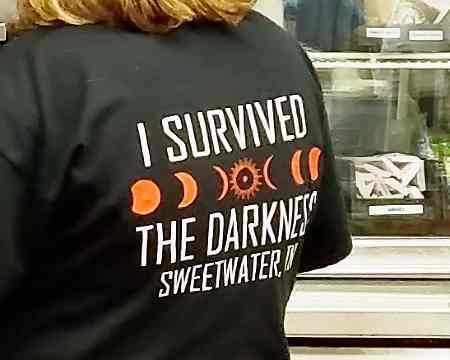 As for leaving quickly, the end of the eclipse was like the green light at a drag strip as seemingly the entire visiting population in Sweetwater filled the access road to the interstate in about one minute. I never touched my other camera, but Zach Riggins’ photos made up for the loss. I started my amateur astronomer career with Comet Kohoutek. Finally after all these years I manage to log a total solar eclipse. 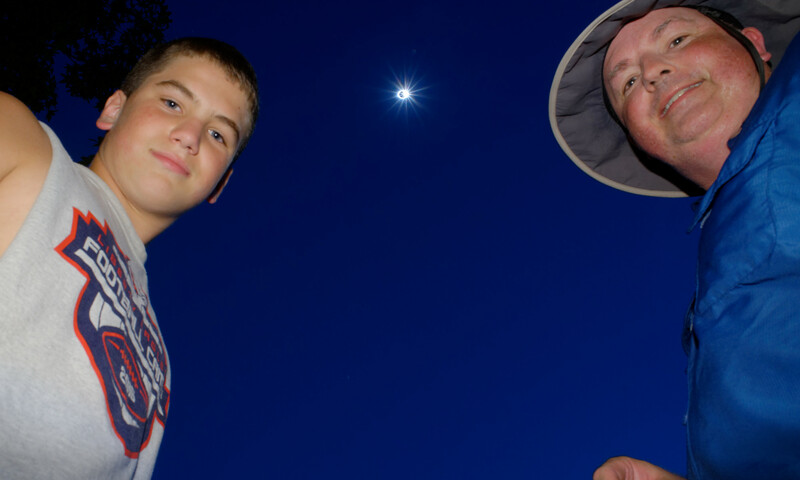 The Great American Eclipse was made even better being able to share it with my son. Love this! Now inspired to capture my own experiences in this fashion. Thank you for sharing your deliberate and contemplative experience. I had not seen anyone mention this anywhere: “Things were darker, but the hue of the light was still daylight color creating a sensation of waning light that doesn’t change color as during sunsets. ” That makes perfect sense and no doubt contributed to the other-worldliness that many experienced. Unless you’re a photographer, and because our brains are so adept for compensating for differences in light temperature, I doubt people are aware enough to notice that. I hope this article is around and accessible to people for the next full solar eclipse.